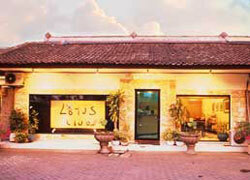 Spa Among Japanese residents in Bali, it’s popular for the finger pressure massage specialty, Lotus Club. You can remove your body stiffness in reasonable price. Especially, foot massage is popular for swelling legs after flight and removing tiredness before departure. It’s recommend the shading off massage which used "BOKASHI Oil," Balinese home medicine! Please choose Massage for 7 points following below. Press sole spots based on the medical and professional theories, and it has effects of improving blood circulation of whole body, recovering tiredness, and enhancing health. It may give pain, however, after massage, you feel your body becomes lighter. While massaging, therapist explains about sole spots. England Style Foot Massage is based on the reflexology theory, use fingers to press sole spots. Use oil and softer massage than Chinese Foot Massage. It is the reflexology with using Bokashi Oil. 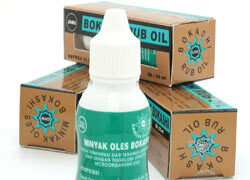 ”Bokashi Oil” is common home medicine in Bali and each home has one. Bokashi Oil is made by the essence of medicine plant and adding EM technology; it has many good effects for body. Whole body massage by finger pressure and massage particularly on shoulder and waist without using oil. The Japanese trainer teaches directly to therapists, so it is the real Japanese Style Body massage. Please request strength of massage to the therapist. It is safe to take for people with sensitive skin. 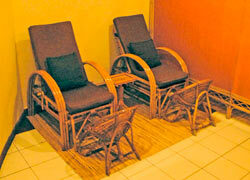 It is the whole body massage especially shoulder and waist that easily to get tired. In addition, Lotus Club offers a bath lobe to wear during massage, usually other Balinese spas take treatment by naked; so the bath lobe is favorable for guests who don’t want to be naked. This menu was created by the request of longer massage than 60 min. and taking more detailed massage. It is the careful massage for 90 min. It is a traditional Thai treatment for a whole body with stretch and technique to improve blood circulation. 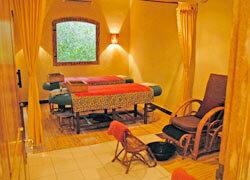 It is Balinese Oil Massage that only Lotus Club can offer with skills of whole body spots. Use the pure natural olive oil for whole body massage. Take treatment in the special single room. It is Bokashi Oil Massage that only Lotus Club can offer with skills of whole body spots. Use the Bokashi Oil for whole body massage. Take treatment in the special single room. 60 min. long Body Massage by 2 therapists. You may feel 60 min. is short and you can be refreshed after the massage. It is the combination menus of Chinese Foot Massage and Japanese Style Body Massage, “Total Body Care.” Enjoy 2 kinds of treatments in one menu, and it’s reasonable price. It is the whole body massage that is combination of Bokashi Foot Reflexology and Bokashi Oil Massage. It’s recommended menu to be healthier by the effect of Bokashi Oil. Free transportation: Kuta, Legian, Seminyak, Sanur, Nusa Dua, and Tanjung Benoa. (with booking 2 persons) For 1 person who booking over ￥3,000 menu, Additional ＄5 /1 car/1 way for above transport area. Ubud, Tanah Lot and Uluwatu, it is available with extra ＄20 for one-way. Children can wait at the lobby or the treatment room during parent's treatment. There are menus for children over age 6. It was the first time for me to have Bokashi oil massage. I become to like the unique smell of this oil, my body got warmed during the massage. I like this kind of massage better than jamu massage. It`s helpful that Lotus Club has Japanese speaking staffs. The massage also combined manual therapeutic technique with treatment method that suitable for everyone. I had full day Bali tour. I was very tired and my legs felt heavy to go to spa, but after I got full body treatment I felt very good another day!